Get Ready for Executive Fight Night VIII! « Shine On! Kids - Supporting children with cancer and other serious illnesses in Japan and their families. Executive Fight Night gives 16 courageous executives the opportunity to join a rigorous 12-week training program run by professional trainers and fighters at Club360. 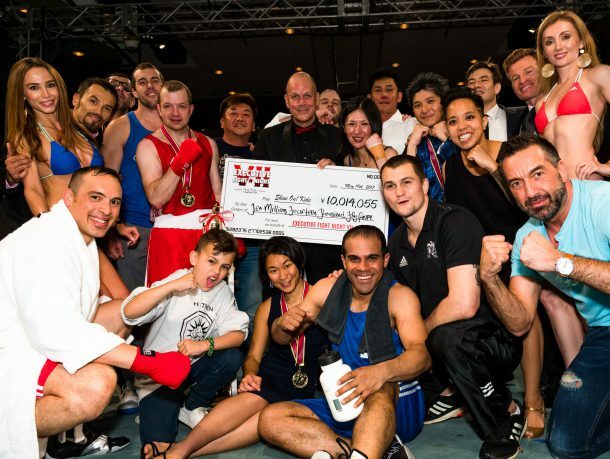 At the end of the EFN journey, they will compete at a Vegas-Style Fight Night on May 25 in front of a roaring packed house at the Grand Hyatt Tokyo! Be part of the action! Enjoy exciting, non-stop entertainment, awesome prizes and a black tie evening of food and drinks with all proceeds benefitting Shine On! Kids’ fabulous Facility Dog Program. Support the fighters in the ring and support the young fighters throughout Japan battling cancer and other serious illnesses. Get your tickets now! Visit www.executivefightnight.com to get your tickets, become a sponsor, and be part of the action!